Weather – Nice and sunny but cooler every week. Nights can be very cool. Water temps are going down too. Can get breezy and windy some days. Water – Getting cooler and less blue. Rough some days now as we move into the cooler months. Fishing – Rougher and cooler waters are making it more difficult to get live bait. That along with changing conditions overall are changing the complexion of the fishing. Less bluewater fish like tuna and dorado. More emphasis on inshore fishing for pargo, cabrilla and other reef fish. 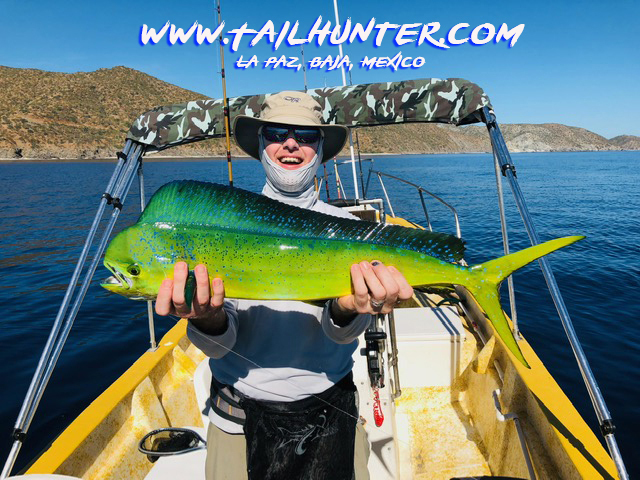 Just some incredible colors on this late-season dorado that Travis caught. Gorgeous fish! Whoa…that’s a big cabrilla! Sweet meat for the grill with Captain Armando. 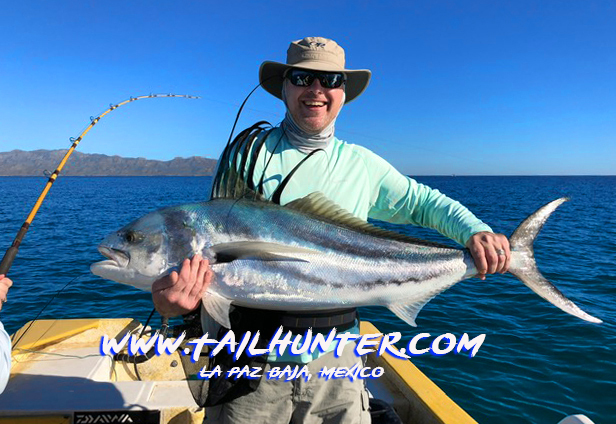 Travis is all smiles posing with his roosterfish, but check out the bent rod behind him! That’s wife, Melinda on another rooster. See the photo below! Both fish released! First-timer rocks it! 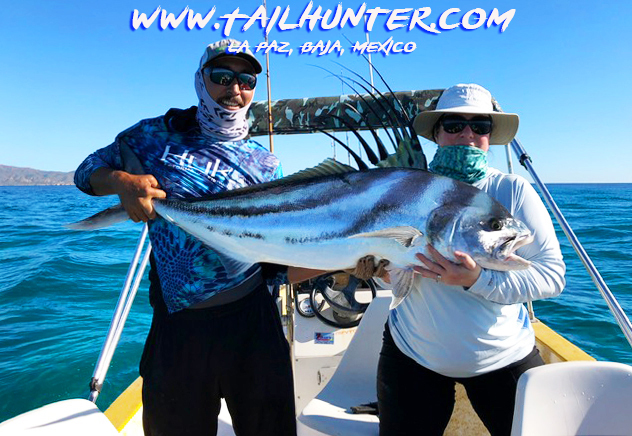 Captain Pancho helps out Melinda Woodward with this hefty roosterfish before releasing it. 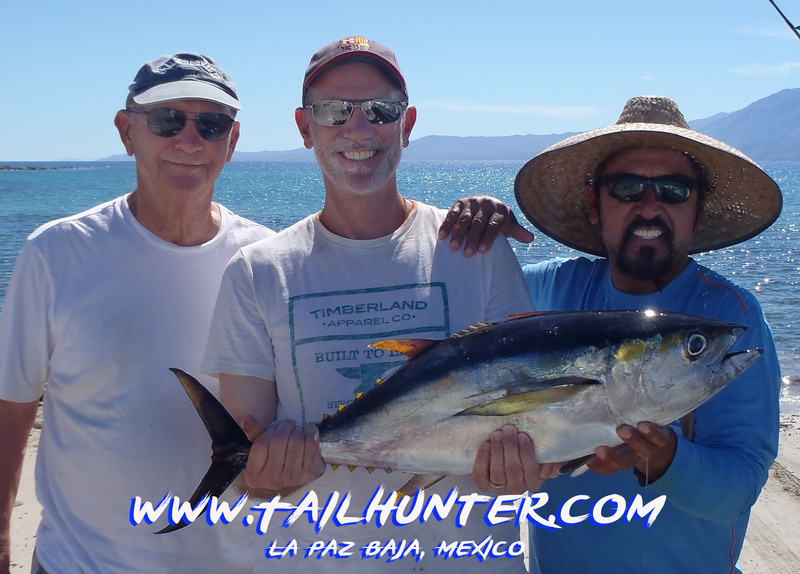 Old Tailhunter amigos for many years, Bill and Patrick with Captain Jorge and a nice yellowfin to go along with a day of bonito fun. 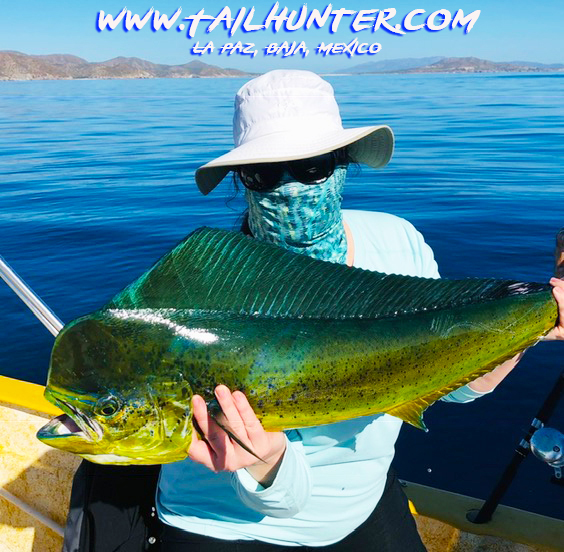 Incredible flat water and perfect for Melinda to catch this sweet bull dorado. 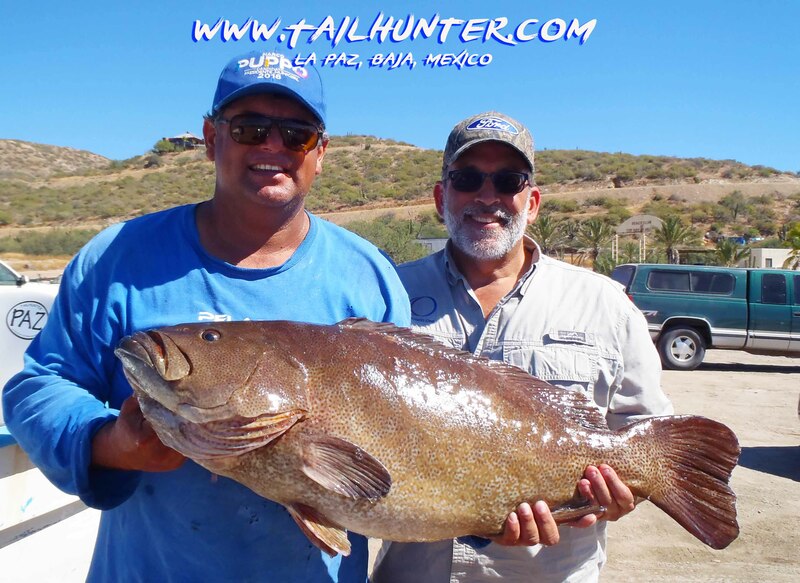 Lots of fun on light tackle…even moreso on a flyrod! Bonito for the masked man from Oregon, Travis Woodward. It was a mixed bag of fish this past week as we transition into the cooler aspects of the season. Not really many folks fishing these days. Many are walk-in visitors or snow-birds who are spending time in town and just want a day of fishing and sunshine, rather than folks coming specifically for fishing. 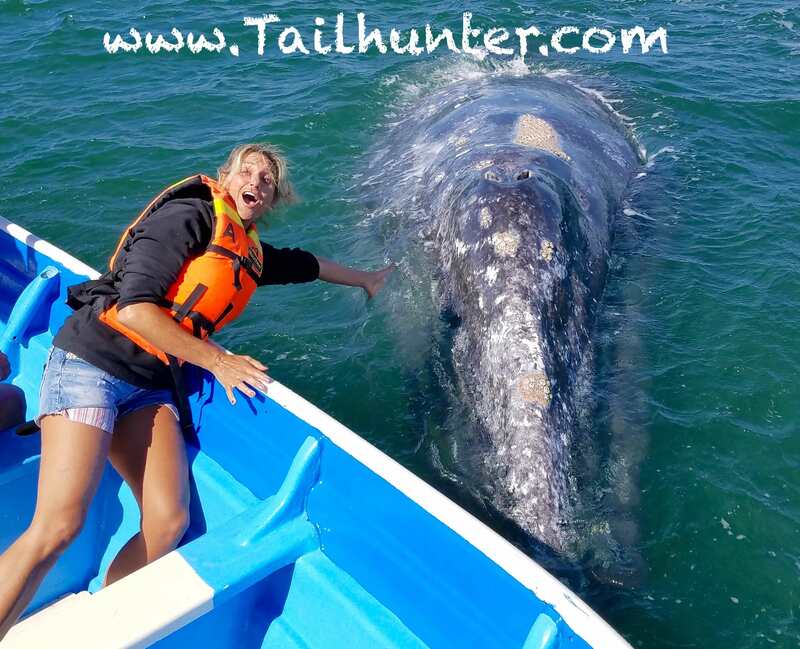 So, many aren’t very serious fishermen either and just want some fun and action. This is that time before the holidays when folks aren’t really travelling much. Families are doing other things. Also, the weather and waters are changing. It’s wonderfully sunny, but definitely cooler and also getting more and more breezy. So, it can be a tad rougher. That makes it harder to get live bait, either because the bait guys aren’t going out very much since there’s not many folks fishing or because of the weather, the live bait is scattered. That being said, we still got some action. Good bites of bonito keep things interesting, especially for the first-timers. 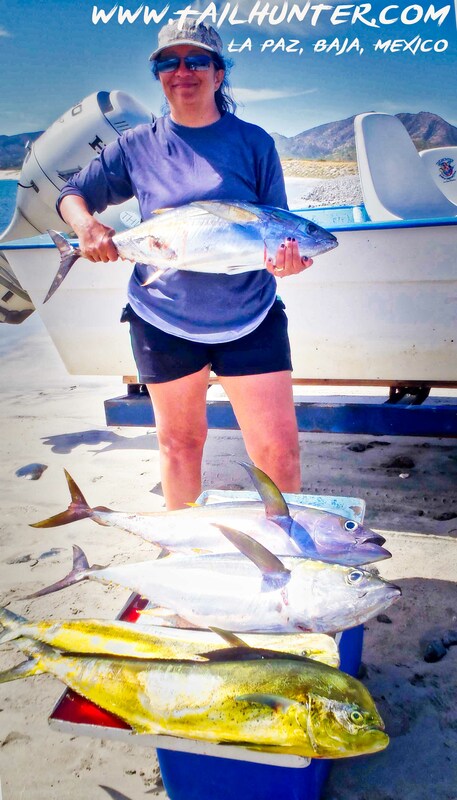 But in between, we’re still getting a few yellowfin tuna up to about 25 pounds. 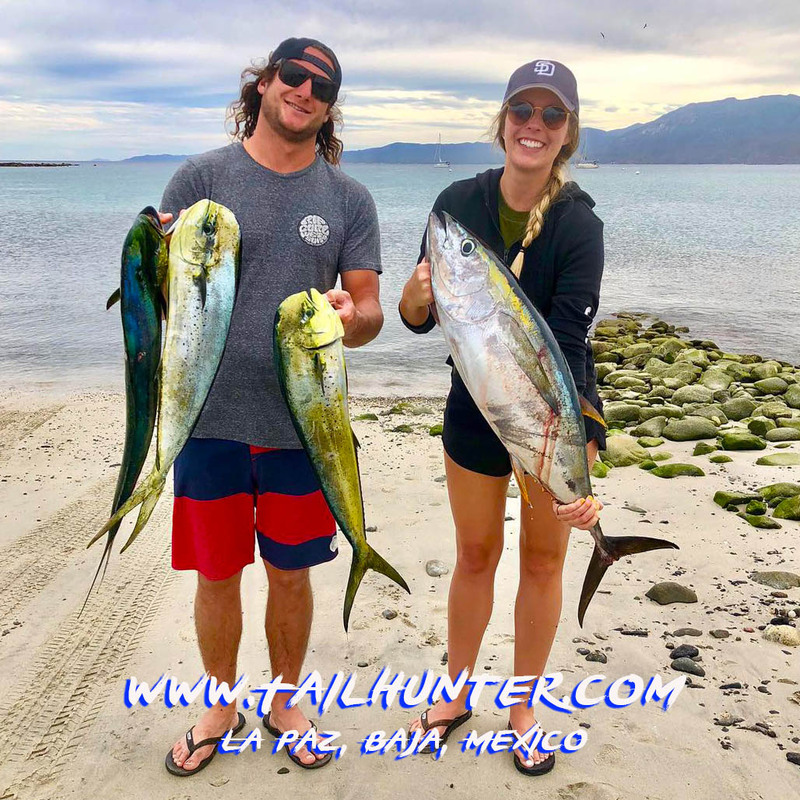 There’s some nice dorado not too far offshore. 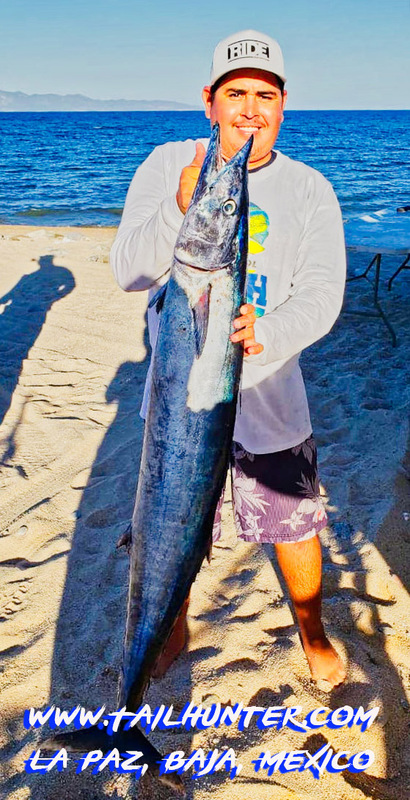 Inshore, pargo and cabrilla are becoming more predominant, especially as it gets tougher to get too far from shore because of weather condition. Also, surprisingly, some nice 30-50 pound roosterfish still around as well. Weather – Beautiful sunny days, but winds are definitely up. Erratically so. Sometimes in the morning. Sometimes in the afternoon. Comes from different directions and sometimes several changes during the same day. So, it can be bumpy and rough some days…some places…but not others. Otherwise, it’s a really pretty time to be in town. Snowbirds starting to filter back to the city. Daytime temps low to mid-80’s. Water – Winds are causing water temps to drop. Also, less blue water and water getting turned over now. 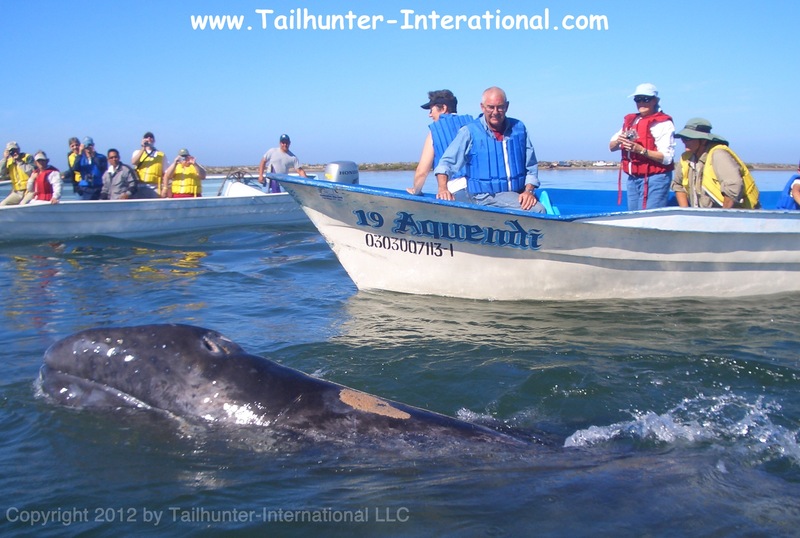 The agitated water is also making it harder to get bait…very important in fishing production. Fishing – Up and down. So many variables now. More wind. Cooler waters. More difficult to find bait. Big moon. By themselves not a big deal, but combined fishing very much affected. Fish are moving around. Different species biting. 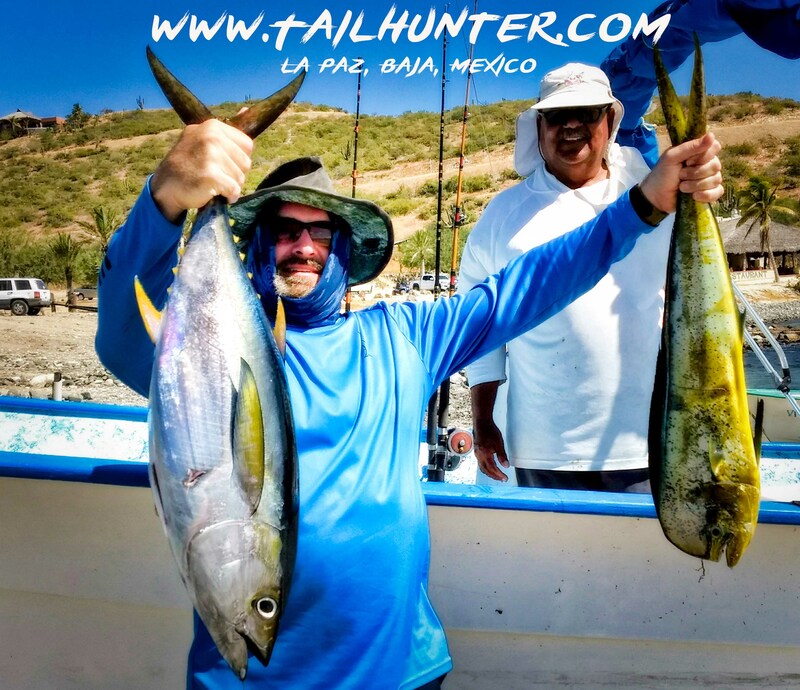 Still some tuna and dorado around. Still some of those big pargo. More cooler water fish inshore. Had a good wahoo week. Also, surprisingly strong for big roosterfish this past week. Outlook – As the wind continue, things will continue to change towards the cooler, rougher water. We’re not fishing much out’ve La Paz anymore with more focus fishing from Muertos/ Las Arenas where it’s a little more protected. Sorry we couldn’t get Marcus his marlin although he tried really hard at it, but he finally got his roosterfish as he and Captain Victor struggle to get a photo and get the big fish released. Punta Perico in the near background. Captain Pancho with our fun Montana friends who had a super day. 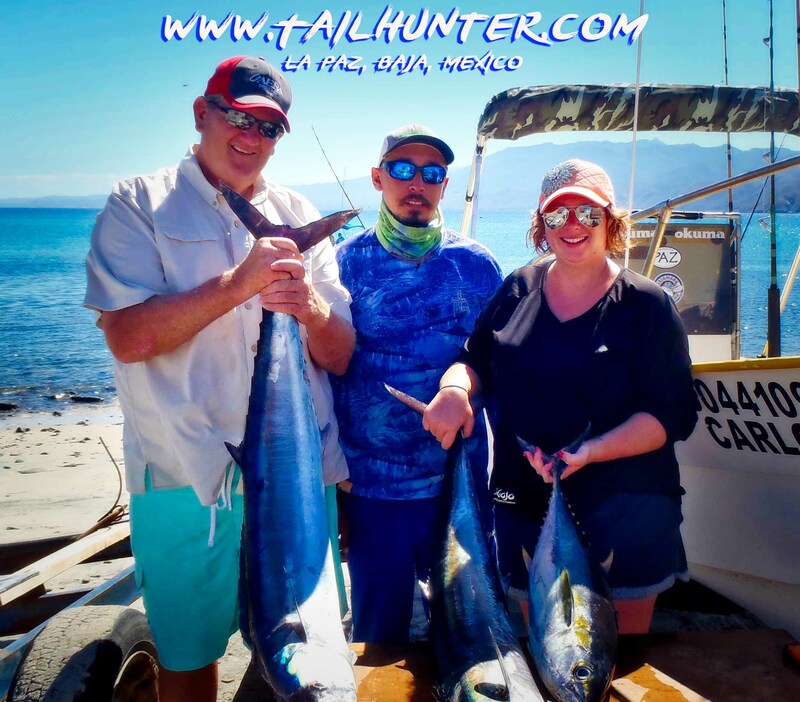 Darrel Zauner and daughter, Marni got two wahoo and a tuna and had a big dog-tooth on the line too! Smiles from George Shaw who finally hit the fish on their 3rd day. Fat tuna in the hands of Darcie…her first tuna and she rocked it like a boss. Good week for wahoo. Came up from the East Cape to find the skinnies. Hi Renee! Fun week with Renee and her husband who hung in there during a scratchy week and finally got into the fish. 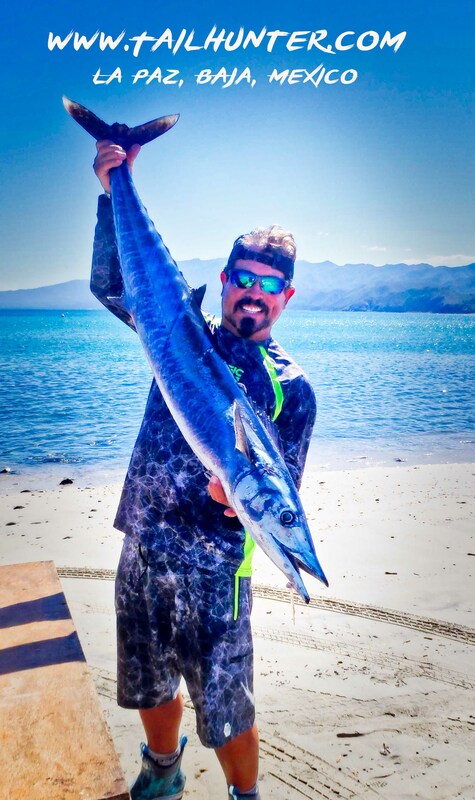 Johnny from Rancho Costa got himself a wahoo for dinner too! 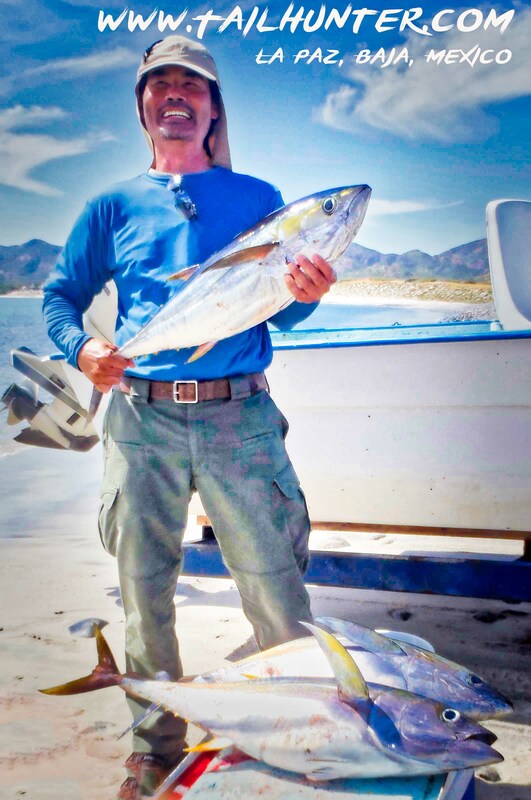 Captain Victor watched Marcus hoist his catch from Bahia Muertos. We had an up-and-down week here. We had some of the prettiest postcard days, but also some days when the sun was out but the winter winds were blowing making it tough to fish. Oh, and a full moon as well! I will officially now say we have passed from the warm water season into the cooler off-season. Winds are starting to blow erratically now. Some from the north, some from the south. It changes from day-to-day and can even change several times during the same day. The result is that the waters have cooled or are getting mucked up. Bait is getting increasingly harder to find and the bait guys either can’t find it or you have to wait until they get enough to sell. Folks get impatient, but what you gonna do? Go fish without bait? That’s the way it is this time of year. 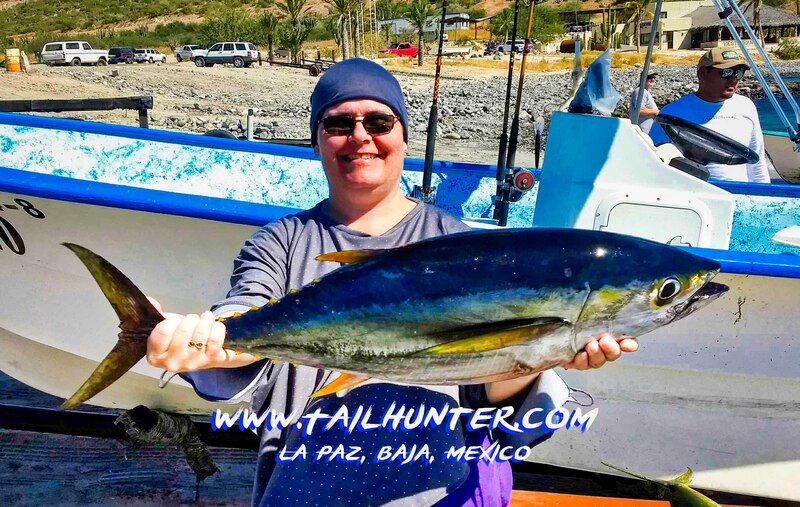 We pretty much aren’t doing much fishing with our La Paz fleet the last week-and-a-half or so. The outside waters are just too unpredictable; fish are scattering now; and bait has become an issue. 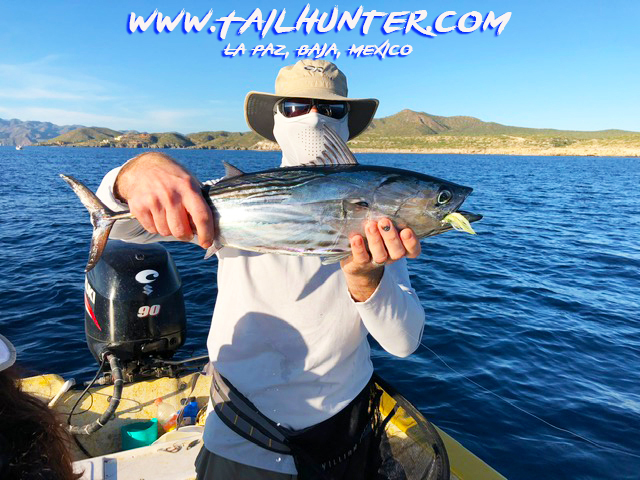 So, most of our fishing is with our Tailhunter Las Arenas Fleet. On the days when we could get bait, there’s still some stray 10-25 pound tuna hanging out. A few dorado here and there. Still some of those nice big pargo liso and big dog-snapper in the rocks, although we didn’t get any to the boat this week and lost all of them in the rocks on busted lines. However, wahoo are still around. Dark Rapalas are still the best option to get them. We got some 20-40 pounders hooked up this week. Also, I was really surprised that we got so many and so many LARGE roosterfish as well. Really not a very prominent time for roosterfish, but I guess they’re still there. Pretty much any of our anglers this week who wanted to get one hooked up at least one and all of them were respectable legit fish.